Out of all that Hollywood has to offer, why do you need to destroy this amazing show? Recently, I came across news that you plan on re-making Breaking Bad. Into… a Bollywood movie. At that very moment, I felt like someone had reached down my throat, grabbed my intestine and twisted it. If my above statement didn’t give it away, I am a diehard fan of AMC’s hit show Breaking Bad. For me, it is the most epic show in the history of television. There’s something very addictive about it; it leaves you begging for more. Surprisingly, the show’s plot is very simple, where the characters hatch completely unanticipated schemes episode after episode. The show is full of ingenious ideas and situations. Its characteristics have made this show one of its kind. The plot twists, cliff hangers and its signature art of storytelling forced viewers to tune in for more. I made up an excuse to avoid a social gathering so I could watch its first episode at home. I ended up binge-watching the show till 3 am with blood shot eyes. I keep trying to comprehend how I feel about the show’s ending. It feels like losing a friend or having your pet die on you. I still have strong imprints of it engraved in my brain. Whenever I walk by a covered house, I instantly conclude that it’s a meth lab and my husband plays along (he, too, is a fan). This is why I feel like Bollywood should stay far away from it. Out of all that Hollywood has to offer, why do you need to destroy this amazing show? Bollywood has already tarnished many of my favourite films. “Dead Poets Society” that transformed into “Mohabbatein”. “Léon: The Professional” to “Bichhoo”. “While You Were Sleeping” to “Har Dil Jo Pyar Karega”. All the Hollywood plot outlines they copied had a rating greater than six points while the remakes barely made it to more than four points. 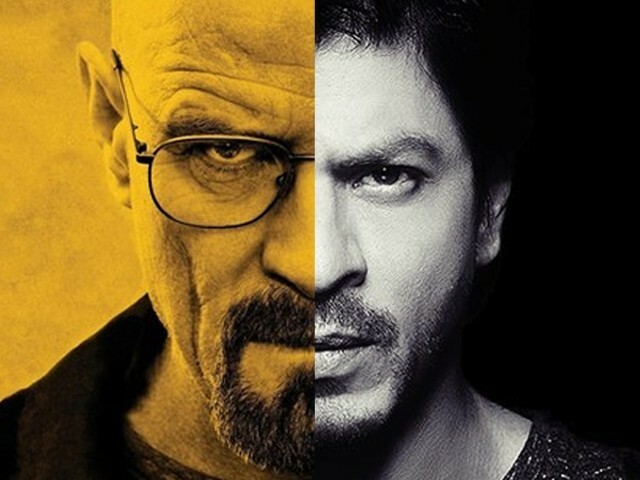 The idea that Heisenberg could be saying “naam to suna hoga” (“You must’ve heard my name”) makes me cringe. I feel sorry for Vince Gilligan who will have to suffer through the trauma of seeing the Bollywood version of his awe-inspiring show. Breaking Bad gained its popularity due to its lead character, “Walter White”. He was a very interesting, yet complicated character. Vince Gilligan sat through major brainstorming sessions to bring out the Heisenberg in a simple chemistry teacher. Most of us believe that good and evil belong to different sets of people but Walter White showed us that it doesn’t work that way. He never failed to deliver sensitive yet vital lessons about knowledge, the human ego and embracing change in different phases of life. The fact of the matter is that the Indian cinema has not really grappled with the complexities of morality. Every Indian movie has a hero who is pure, represents everything that is good in the world, and a villain; someone who represents all the evils. Walter White, although was dealing in meth, was the show’s hero – not the villain. Indian audiences would have difficulty understanding and appropriating such a character; which is why you have said that you will create a diluted version of the show. Consider this for a moment: What was the show without the moral dilemmas that surrounded Walter White’s actions? Without that scintillating edge, the show was about a guy dying of cancer trying to help his family out. The reason that the series was able to secure such fandom was because we were drawn to the immorality of the moral family man. Yes, you might just ask me to not watch the Bollywood version if it pains me that much. But just the knowledge that the legacy of the show has been tarnished with item songs and shady dialogue would be enough to send me over the edge. Bollywood is terribly formulaic. I admit that it works for some films, but if Breaking Bad is run through the mill, whatever churns out will not be the brilliance we have experienced for five terrific seasons. So hear me out, please. Stick to stuff like “Dil Wale”. Remember the last time you tried to do something different? Yeah. “Ra-One” happened. We all regret that now, don’t we? A true “Breaking Bad” Pakistani fan. Lost you at “The most epic show in the history of television”. Most Bollywood blockbusters garbage are either remake like Sholay or utter crap like DDLJ. A big portion of Indians do not have access to Hollywood. Even if they do , a lot of them I bet do not understand the basics let alone the cultural nuances being portrayed in serials like breaking-bad. They may not be as modern and ‘western’ as you. Somebody has to take the Hollywood piece and translate it and customize it for the Indian masses. Why not let them at least try? The Indian market place decides what is a hit and what is not. The viewers vote with their money. There is a big market for such copies and hence a big segment of Bollywood keeps producing copies of hits from other markets like Hollywood and South Indian films. Dead Poets Society” that transformed into “Mohabbatein”. Disagree….apart from both being set in a college, the plots were vastly different. Rakshinda Mujeeb: You are not well versed with India. While you are right in saying that BOLLYWOOD, by and large, sees the world as black and white in classic escapist cinema, that is not true for INDIAN CINEMA which consists of movies made in pretty much all Indian languages. Take a look at Malayalam cinema, some Tamil cinema, some Marathi cinema etc before you talk of “Indian cinema” and make generalizations. Aside, Telugu cinema is worse than Bollywood on this score. More importantly, while Bollywood is to a large extent black and white, Indians are used to shades of grey because every Indian is fed on a steady diet of the Mahabharata which is the most intricate, complex, grey and enchanting book/story one can ever read. So I don’t think that will be a problem if Shahrukh chooses to implement it in letter and spirit(although he wont). Agree, agree……..I almost missed my flight because I refused to shut the TV half way through an episode of Breaking Bad. I’m cringing at reading the negative responses towards that letter of so many readers. Can’t help but agree with Rakshinda, word to word. I can’t imagine how terrible it would be for all Breaking Bad fans all over the world to watch this masterpiece crumble to ruins and get converted to this incomprehensible mess that I’d be puking on. Ra One was a good movie. And I love superhero movies. I have no regrets about that. Also, let’s say for the sake of argument that Bollywood isn’t able to handle the concepts found in Breaking Bad and deliver complicated characters (which is kind of a sweeping statement that isn’t completely accurate). So…that means creative people in India should never ever try to do that? You mention the “black and white” characters in Bollywood movies, then you complain when people try to produce projects that address the moral ambiguity in life in Bollywood movies. Sure…makes sense to me. I guess…okay, no not really. Excellent!! Very well-written. You have spoken the minds of all true breaking bad fans from across the border! I wake up in cold sweats thinking about how this talentless hack is going to butcher our beloved show! No one wants this!! Western TV actor? Even if SRK reincarnates 10,000 times he cannot achieve the level of perfection achieved by Bryan Cranston in a single frame! SRK doesn’t have enough talent to fill a teaspoon, and you are comparing him to one of the best actors in the world?